The continual development of technology means that there are abounding opportunities to simplify life in a variety of ways. One of these is using a digital wallet for online purchases. You have a variety of options available to you like Google Pay, Apple Pay, Chase Pay, and Walmart Pay. Many merchants accept Apple Pay, but some places like Walmart will only accept one digital wallet for purchases. We have compiled two pros and two cons of using a digital wallet for online purchases in order to assist you in figuring out if a digital wallet is a good fit for you. Perhaps one of the greatest benefits of a digital wallet is that you do not have to worry about the location of your wallet anymore. 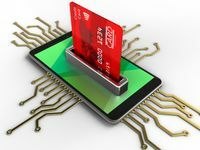 If you are like my brother-in-law who regularly misplaces his wallet, a digital wallet could be extremely useful to you because all you need is your phone. Nowadays almost everyone has his or her cell phone right beside him or her a good portion of the time. In addition, a digital wallet is a fast and secure way to make purchases. You do not have to worry about memorizing your credit card number anymore. Instead, your credit card is easily accessible through your digital wallet. Because a digital wallet has a specific number associated with it, your credit card number is not available to the merchant, making it a more secure way to purchase items. A con of using a digital wallet is that you do not have a way to pay if you do not have your phone for some reason. This is especially true if the battery is dead on your phone. You have to wait a little bit before being able to make a purchase. Additionally, depending on which mobile payment platform you have, you may not always be able to use a digital wallet. Some like Chase Pay and Apple Pay are fairly universally recognized, but others are not. You need to be ready to have an alternative payment method if your digital wallet platform is not supported by the merchant. In the end, it depends on you. If you tend to like the ease of paying quickly, you may be a good candidate to use a digital wallet for online purchases. On the other hand, if you do not like the uncertainty of not knowing if your digital wallet will be accepted or if you tend to drain your phone battery, using a digital wallet for online purchases may not be for you.